1. Member, Academic Council, CUSAT, Kochi. 2. Head, Department of Animal Breeding, Genetics and Biostatistics, College of Veterinary and Animal Sciences, Mannuthy. 4. Director, School of Applied Animal Production and Biotechnology, Kerala Veterinary & Animal Sciences UniversityMannuthy -680651, Thrissur. RajibGoyal Prize for Young Scientist – 2001 in Veterinary Sciences – for outstanding contributions in the field of Veterinary Sciences by the Kurukshetra University, Kurukshetra, Haryana, India. First position for the Poster in the National Conference on New Horizons in Animal Breeding Technologies for Accelerating Livestock production and Health- January 20-21, 2011 at IVRI Izethnagar, organized by the Indian Society of Animal Genetics & Breeding. Certificate of Appreciation by Kerala Agricultural University for securing External funded projects for the period from 19-08-2000 to 31-12-2004. Appreciation by the Department of Biotechnology, Govt. of India, New Delhi, for the good work done by the PI under the DBT funded project ‘Molecular Genetic Characterisation and Genetic Improvement of Malabari Goat’ in July 2003. Honoured by the Vice–Chancellor and General Council of the Kerala Agricultural University for the outstanding research achievements by the applicant on 26th July, 2003. Second best paper” published in Indian. Journal of Dairy Science in the year 1998. Senior Research Fellowship (CSIR) for undergoing Ph.D programme in Animal Biotechnology in the year 1995. (Did not utilize the fellowship). Senior Research Fellowship (ICAR) for undergoing PhD programme in the subject of Animal Biotechnology in the year 1994. Second Rank in M.Sc. (Animal Biotechnology) from National Dairy Research Institute (Deemed University), Karnal in the year 1992. “ICAR Junior Fellowship” in the discipline of Animal Breeding & Genetics in the year 1990 for undergoing M.V.Sc. programme (Did not utilize the fellowship). Kerala Veterinary College Alumni Association Gold Medal in 1987 for securing first rank in B.V.Sc. & A.H degree programme. “K.S. Nair Memorial Prize” for the year 1986 for securing highest GPA in the group of courses in Animal Management, Animal Nutrition, Animal Breeding & Genetics and Dairy Science of B.V.Sc. & A.H.
“Trivandrum Livestock Improvement Association Prize” in the year 1986 for securing highest GPA in B.V.Sc. & A.H course. “Inauguration Souvenir Prize” in the year 1986 for securing highest grade point average in group of courses in Microbiology, Parasitology and Pathology of B.V.Sc. & A.H.
“T.V. Kochuvareed Memorial Prize” in the year 1986 for securing the highest grade point average (GPA) in B.V.Sc. A.H.
“M.O. Thomakutty Memorial prize” in the year 1986 for securing highest GPA in the group of courses in Physiology and Biochemistry of B.V.Sc. & A.H degree programme. “Mrs. Devaky Nair Endowment Prize” for the year 1984 for his having excelled himself in social service activities in the B.V. Sc. & A.H. degree programme. Advanced Molecular Biology Tools used in Animal Disease Diagnosis and Development of New Generation Vaccines. M.V. Silpa., T. Naicy., T. V. Aravindakshan., G. Radhika., Anu Boswell and M. Mini (2018). Sirtuin3 (SIRT3) gene molecular characterization and SNP detection in 2 prolific and low prolific goats breeds. Theriogenology doi: 10.1016/j.theriogenology.2018.09.008. AnjanBehera, R. ThirupathyVenkatachalapathy and, Aravindakshan, T.V.(2018). Identification of novel single nucleotide polymorphism at thyroid hormone responsive (THRSP) gene of native goat breeds of India. Small Ruminant Research163 : 68–71. Jain Jose, K., BinduLakshmanan., Hitaishi, V.N., J.E.Praveena., K.Syamalaand T.V. Aravindakshan. (2018). Detection of Babesiacanisvogeli.Babesiagibsoni and Ehrlichiacanis by multiplex PCR in naturally infecteddogs in South India. VeterinarshiArchiv 88 (2) 215-224. P.N. Shivakumara., T.V. Aravindakshan., Thomas Naicy., K. Anilkumar. andR. Uma. (2018). Molecular characterization and differential mRNA expression profiling of Toll-like receptor-2 gene in Vechur (Bosindicus) and crossbred (Bosindicus X Bostaurus) cattle of Kerala in response to anthrax vaccination. Meta Gene16 15–20. Thomas Naicy, R.T. Venkatachalapathy, Joseph Siju, and Aravindakshan,T.V. (2017). Elizabeth Kurian, Joan Jose, AnuBosewelland M.V.Silpa. (2017). Molecular characterization and differential expression patterns ofthe goat Nerve Growth Factor (NGF) gene during different growth stages Mgene (doi:10.1016/j.mgene.2017.09.004. Jain KJ, Lakshmanan B, Syamala K, Praveena JE, Aravindakshan T.V. (2017) High prevalence of small Babesiaspecies in canines of Kerala, South India, Veterinary World, 10(11): 1319-1323. Abhilash R.S., Metilda Joseph., M.O. Kurien, Hiron M. Harshan ., Aravindakshan, T.V., K.S. Anil and Gleeja V.L (2017). Impact of Trans vaginal oocyte recovery on ovarian biometry and oocyte yield in crossbred cattle of Kerala. International Journal of Science, Environment and Technology, Vol. 6, No 5, 2766 – 2770. Jain Jose., BinduLakshmanan., Aravindakshan, T.V., Hitaishi, V.N. and Binu K Mani. (2017). Evaluation of DNA extraction protocols from ixodid ticks. Int. J. of Science, Environment. 6: (3) 1912-1917. Lakshmi R., Jayavardhanan K.K., Aravindakshan, T.V (2016). Characterization of promoter sequence of toll-like receptor genes in Vechur cattle, Veterinary World, 9(6): 626-632. Radhika, G; Raghavan, K.C; Aravindakshan, TV. andThirupathy, V. (2015). Genetic diversity and population analysis of native and crossbred goat genetic groups of Kerala, India. Small Ruminant Research. No. of pages 8. Radhika, G; Raghavan, K.C; Stephy,T; Aravindakshan, TV. Mercey, KA andThirupathy, V. (2015). Novel PCR-RFLP for detecting single nucleotide polymorphism in exon 1 of GPR54 gene and its association with age at first kidding in goats. Indian Journal of Animal Sciences85 (9): 1056-1058. Bhosale, R.A., and Aravindakshan, T.V. (2013). Cloning and sequence analysis of the growth hormone gene of Asian elephant. Indian Veterinary Journal 90 (10) : 45-49. Rajeev, M. and Aravindakshan, T.V. (2010).Molecular cloning and characterization of alpha lactalbumin gene of Vechur cattle. Indian Journal of Animal Sciences 80 (6): 541-546. Antony, P.X., Nair, G. K., Mini, M., Jayaprakasan, V., Aravindakshan, T.V., George, S and Karunakaran, S. (2010). Identification of immunodominant proteins of Pasteurellamultocida from ducks. Indian Veterinary Journal 87 (4) : 329-331. Amrita Susan Jacob and Aravindakshan, T.V. (2008). Genetic Diversity in four South Indian Goat breeds based on Microsatellite polymorphism .Indian Veterinary Journal85: 946-949. Aravindakshan, T.V. and K.V. 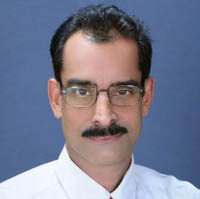 Raghunandanan (2008). Association of microsatellite polymorphism with production traits in Malabari goats. Indian Veterinary Journal 85: 272-275. Aravindakshan, T.V. and James, S. P. (2008). Kappa casein gene polymorphism in Vechur and Kasargode cattle. Indian Veterinary Journal85:31-36. Aravindakshan, T.V., James, S. P. and Raghunandanan, K.V. (2007). RFLP at the growth hormone gene locus in Vechur and dwarf cattle of Kerala. Indian Veterinary Journal 84: 1247-1250. Antony P.X., Nair, G.K., Jayaprakasan, V., Mini, M., Aravindakshan, T.V. and Ravishankar, C. (2007). Plasmid profile and Antibiogram of isolates of Pasteurellamultocida from ducks in Kerala, India. Research Journal of Microbiology 2(4):387-391. Antony P.X., Nair, G.K., Jayaprakasan, V., Mini, M., and Aravindakshan, T.V. (2007). Nucleic acid based differentiation of Pasteurellamultocidaserotypes. International Journal of Dairy Science 2 (2):178-182. Aravindakshan, T.V. (2006). Analysis of Mutations in the ITGB2 Gene in Goats Using PCR-RFLP and DNA Sequencing. Indian Journal of Dairy Science59(5): 296-299. Aravindakshan, T.V. and James, S. P. (2006). Screening for Bovine Leukocyte Adhesion Deficiency (BLAD) genetic defect in Vechur cattle. Indian Journal of Animal Sciences 76:712-715. Suprapha, P., Anilkumar, K., Aravindakshan, T.V. and Raghunandanan, K.V. (2005). Assessment of bandsharing values in RAPD-PCR analysis of dwarf cattle of Kerala. Asian Australasian Journal of Animal Sciences 18 (9):1217-1220. Aravindakshan, T.V. (2005). Polymorphism at Kappa Casein and Prolactin loci in goats investigated by PCR-RFLP and DNA sequencing.Indian Veterinary Journal 82 (2): 126-130. Chitra, R. and Aravindakshan, T. V. (2004). Polymorphism at growth hormone gene in Malabari goats investigated by PCR-RFLP. Indian Journal of Animal Sciences74 (12):1215-1218. Aravindakshan, T.V.,Venkatachalapathy, R.T., James, S. P., Kurien, E. and Iype, S. (2004). Polymorphism at prolactin gene locus in Vechur and other dwarf desi cattle of Kerala detected by PCR-RFLP. Indian Journal of Dairy Science. 57 (4): 246-249. Aravindakshan, T. V., Joseph, J. E., Smitha, K. B. and Anilkumar, K. (2004). Amplification and Restriction enzyme analysis of GLA-DRB3 second exon in Malabari goat. Indian Veterinary Journal81:1197-1202. Aravindakshan, T.V.,Venkatachalapathy, R.T., Iype, S. and James S.P. (2003). Analysis of polymorphism at the b–lactoglobulin locus in Vechur and dwarf cattle of Kerala using PCR-RFLP. Indian Journal of Dairy Science, 56(3): 163-166. Aravindakshan, T.V; Nainar A.M. and Sivaselvam, S.N. (2000). Polymorphism of exon 2 of the BuLA-DRB3 gene in Indian buffalo (Bubalusbubalisvarindicus) detected by PCR-RFLP. Animal Science,70:221-226. Aravindakshan, T.V. and Nainar, A.M. (1999). Genetic polymorphism of the BoLA-DRB3 gene in Jersey crossbred and Ongole cattle revealed by PCR-RFLP. Indian Journal of Animal Sciences69 (6):424-427. Aravindakshan, T.V;Nainar, A.M. and Nachimuthu, K. (1998). A simple and efficient method for isolating high molecular weight DNA from bovine sperm.Indian Veterinary Journal75: 314-317. Aravindakshan, T.V. and Nainar, A.M. (1998). Genetic variation in cattle and buffalo breeds detected by random amplified polymorphic DNA (RAPD) markers. Indian Journal of Dairy ScienceLI (6): 368-374. Aravindakshan, T.V; Nainar, A.M. and Nachimuthu, K. (1998). Extraction of DNA from cattle white blood cells. Cheiron, 27: 80-84. Aravindakshan, T.V;Nainar, A.M. and Nachimuthu, K. (1997). High salt method: a simple and rapid procedure for isolation of genomic DNA from buffalo (Bubalusbubalis) white blood cells. Indian Journal of Experimental Biology 35: 903-905. Aravindakshan, T.V.Nainar, A.M; Ramadass, P and Nachimuthu, K (1997). Genetic polymorphism within the growth hormone gene of cattle and buffalo (Bubalusbubalis) detected by polymerase chain reaction and endonuclease digestion. International Journal of Animal Sciences12: 5-8. Aravindakshan, T.V. and Sharma, A. (1996). Effect of platelet activating factor on the motility and acrosome reaction of buffalo (Bubalusbubalis) spermatozoa Theriogenology, 45: 991-999. Aravindakshan, T.V. and Sharma, A. (1995). Induction of acrosome reaction in fresh and frozen-thawed bovine spermatozoa by platelet activating factor. Indian Journal of Experimental Biology 33: 87-90. SosammaIype; Raghavan, K.C; Girija, C.R; Aravindakshan, T.V; Radhakrishnan, J. and Mukundan, G. (1994). Milk fat percentages at various stages of lactation of crossbred cattle in Kerala. Indian Journal of Animal Sciences64 (3) : 312-313.